In Greek mythology, when Zeus and Poseidon agree to play on nature to remind the mortals on their foolishness, they merely swing around. If both were in agreement to remind other gods that they should be reckoned for all time, they bring out the worst. Zeus was a rain god, the god of the sky, of thunder and thunderbolt. Storms were his expressions. Poseidon, on the other hand, a full brother to Zeus, was a god of earthquakes and the sea represented as tempestuous, subject to sudden and violent rages and vindictive. Both were guardians of climate, and well, of climate change too. When climate is disturbed, their godly congress is suspect and their manifestation is a combination of nature’s fury. The effect is devastation. In Greek parlance, a superstorm is a form of Olympian anger directed at mankind and at other lesser gods. But of course that was before when science was still in infancy. To date, science is aided by technology, its advancement all the time is considered mind boggling already. It could predict and even foresee the future, the evolutionary trends for which not only man but that of the entire universe is moving towards. In the past, mankind is merely dependent on his gods for salvation. If he perishes, he was not good enough. If he survives, he was favored. We have science and technology working for us. It can help us endure and adapt. Anything unusual can be anticipated except stupidity. Calamities, its effects and deleterious outcome are limited only to those who choose to confront and challenge its might. There is adventure; there is fun in the confrontation. It is extreme sports. And so when a superstorm was announced days before its landfall, people, especially those in typhoon belt, thought that they were about to see the same pattern—packing winds, sudden rain, flash floods, twigs flying and some landslides, the usual weather, a natural routine. It was a similar scenario in the past as their ancestors have noted and it was merely for them like a simple tooth extraction—bloody and painful only for a while. After all, they have been there in the place and they knew all the time that it was a play station for Zeus and Poseidon. Indeed, there was a superstorm—a tropical cyclone, the 30th in the 2013 pacific typhoon season. 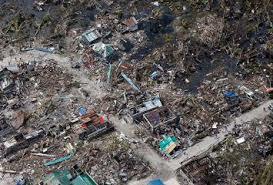 It is internationally called Haiyan, it is Yolanda in the Philippines. Its arrival on the shores of central Philippines has been announced. The Voice of America was in every radio station revealing a satellite feed. Accordingly, it was formed in November 2, 2013 as an area of low pressure several hundred kilometers east-southeast of Pohnpei in the Federated States of Micronesia. The next day, it would become a tropical depression. Days after, the storm’s maximum ten-minute sustained winds would increase and it has been noted that it has breached the velocity in relation to an extra ordinary cyclone. Japan, HongKong and China meteorological observatories were stunned at what they were tracking. It was a monstrous category 5 super typhoon and it was headed for its landfall in the middle islands of the Philippines packing a 315 km/h sustained wind, the fourth strongest, if not the strongest, typhoon ever recorded in terms of wind speed. It can sweep anything immovable along its path. As it landed in the province of Leyte, one of the Visayan islands, it was noted that it was the country’s strongest storm recorded at landfall. It surpassed the record 305 km/h previously experienced sometime in 1931 which claimed some 15,000 lives. As the storm ravaged several islands, as it swished through five consecutive landfalls in the country before emerging over to the West Philippine Sea onwards to Vietnam, if left, according to UN, about 11 million people affected, thousands of family rendered out and left homeless and around 5,665 confirmed deaths a few days later. Preliminary estimate on the total cost of damage was placed at $1.55 Billion (USD) or P40 Billion, almost the same cost lost in government in a year’s time as a consequence of corruption. What Yolanda did for Leyte, corruption did the same to national coffers. In this season of calamity, the Filipinos would suffer back to back losses. National psyche is strong however. It can weather any agonizing moment through. CNN’s Anderson Cooper observed that he saw devastation up -close, the worst kind in one community in Leyte and surprisingly noticed that people in the area were smiling as if having fun. Filipinos are used to such pain. Surely they would have their fill and fun is greater once the corrupt sector is also executed! Posted on December 2, 2013, in Uncategorized and tagged Climate change, Greek mythology, Philippines, Poseidon, Zeus. Bookmark the permalink. Leave a comment.